五彩滩. 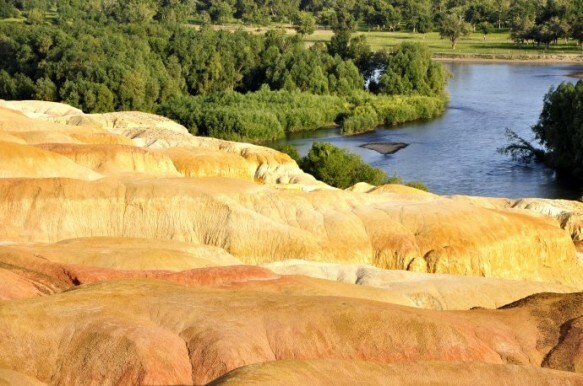 Spelled out in pinyin it’s “Wucaitan“, which has been translated as either “Rainbow Beach” or “Five-Colored Hills“. 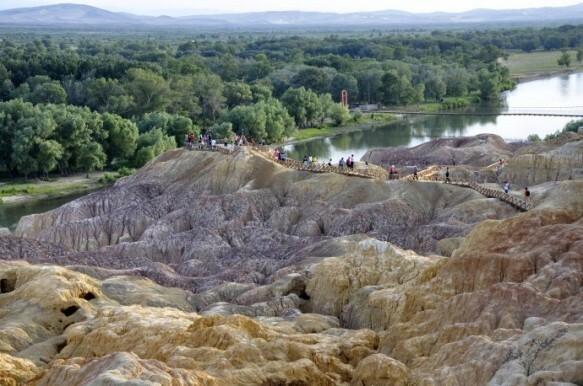 Although normally dwarfed by Kanas Lake, it’s popular neighbor further north, this scenic Xinjiang gem is worth a second glance…if not a visit. 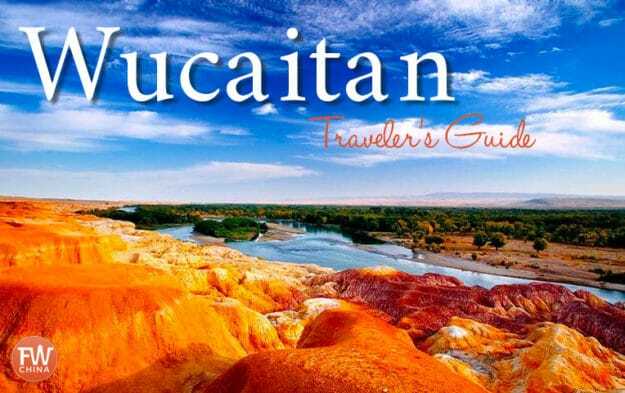 This simple guide to Wucaitan will provide you everything you need to know! Wucaitan is not your typical tourist destination in Xinjiang, China. You won’t find much written up in the major travel guides and it’s generally more popular with the Chinese than it is with foreign tourists. If you’ve seen pictures, however, you know that it can be a stunning location. Below I’d like to give you a quick snapshot of this travel destination as well as tips on how to get there and what you’ll see. 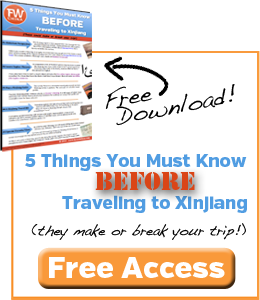 Remember, you’ll find all of this information and so much more in the FarWestChina Xinjiang travel guide. Download a free chapter using that link or purchase the full guide as a PDF or Kindle! 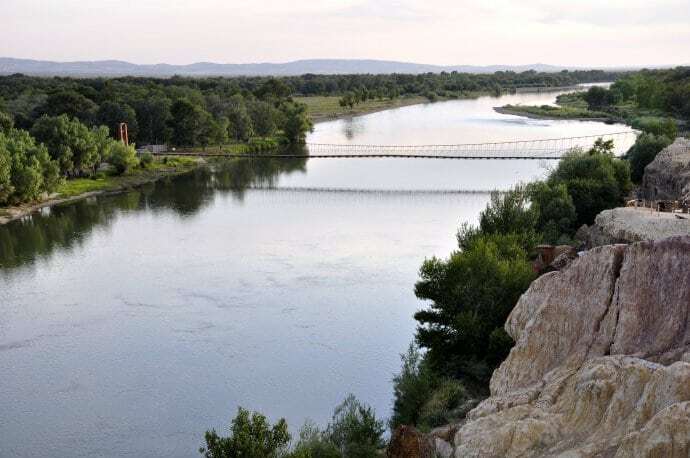 Located along the Irtysh (Ertix) River in northern Xinjiang, Wucaitan is not the typical tourist destination for most foreigners. However, because it’s only 24 kilometers northwest of Burqin – often the home base for trips up to Kanas Lake – it’s definitely worth considering. Unlike Karamay Ghost City a couple hours to the south, the draw of Wucaitan is the fascinating combination of colorful rock, riverbed and greenery. At dawn and dusk, the sun has a way of causing these rocks to glow with vibrant colors. Wind-worn rock formations ranging from 5 to 25 meters in height line the bank of the only river whose waters reach the Arctic Ocean. Wooden pathways snake through the colorful arrangement to provide various angles for incredible photographic opportunities. The drive out to Wucaitan is quite interesting. The smooth, paved road from Burqin follows the north side of the Ertix River, the side that is barren desert. Visible to the south of the river is the stark contrast of a lush, green river valley. 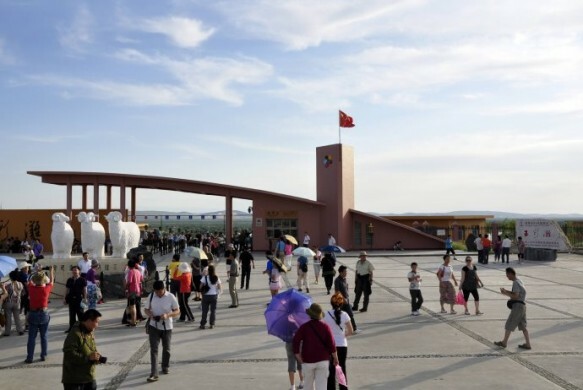 The buildings that welcome you to Wucaitan seem to rise up out of nowhere, and as with many places in China, the significant investment that went into the construction of the scenic spot seem ostentatious compared to the number of actual visitors. From Burqin, it is possible to take a bus or a taxi out to the Five Colored Hills (五彩滩) for fairly cheap. 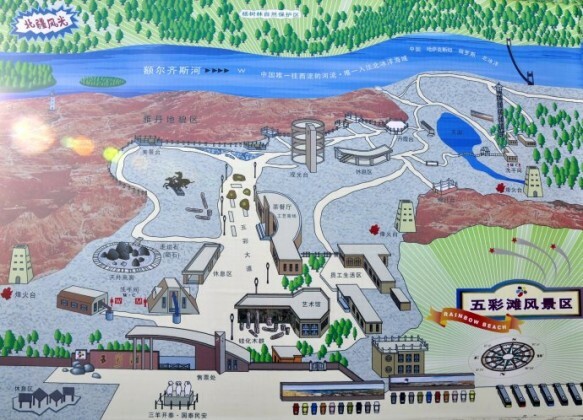 If, like most Chinese tourist, you take part in a guided tour of northern Xinjiang, make sure that Wucaitan is part of the tour and the bus will take you directly to the park. A couple hours walking around will be more than enough, but some of the best photo opportunities come at sunset, so plan accordingly. During the summer mid-day can be incredibly hot so make sure you bring plenty of water! This map, not set to scale, will give you a good idea of the layout of the Wucaitan 五彩滩 scenic area. 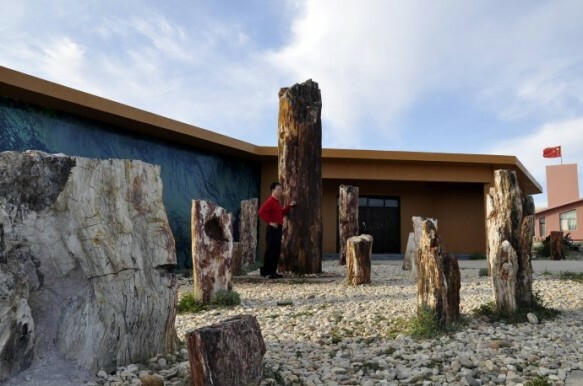 Bathrooms are near the entrance as is the Petrified Wood Museum. Snacks and drinks are sold inside, but go ahead and bring your own. 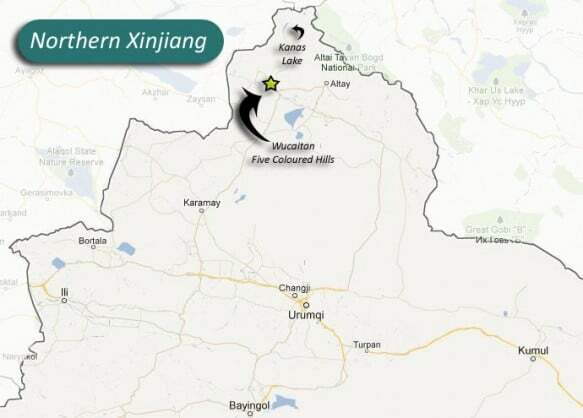 The map below should give you an idea of where Wucaitan (Five Colored Hills) is located in relation to the rest of Northern Xinjiang. Contrasts are what make this site special. If you’re planning to travel to Xinjiang, remember to grab a copy of the FarWestChina Xinjiang travel guide! Also, if you’ve made your own visit to Wucaitan, leave a comment below and let everybody know what you thought of it! Really enthusiastic about your website, it’s a goldmine.. I find the information on Xinjiang everywhere else online very sparse. In Urumqi at the moment I’m looking at Wucaiwan, much closer and north east from here. Would love to hear about your experience there if you’ve been, or even just know of it. Good continuation and all the best for the year of the goat! Hey Robin, glad you found the site useful! Thanks so much for stopping by and commenting. 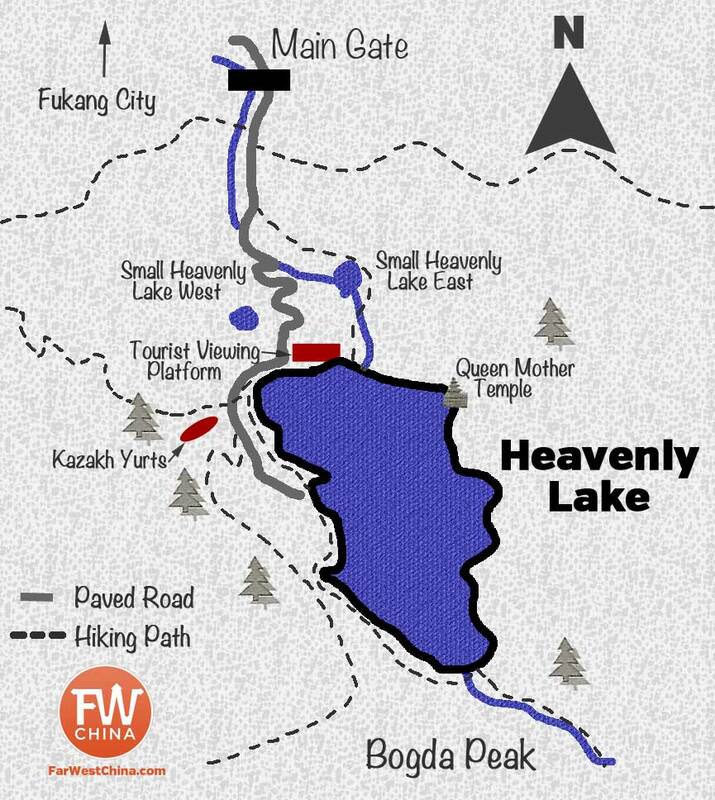 Wucaitan is a bit of a drive from Urumqi so I usually suggest that people just stop by on their way up to Altay (Kanas Lake area). It’s certainly a treat to see, especially if you can be there during sunset or sunrise. By itself, however, you might find that the long drive to get there isn’t really worth it. 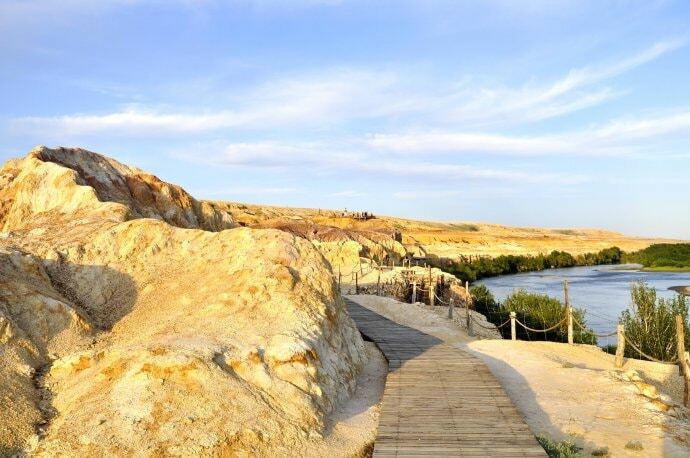 Perhaps you can make a trip up to Karamay to see the Ghost City in Wuerhe and then make a day trip up to Wucaitan? That’s another good option. This looks amazing. So much I missed on my trips to Xinjiang. I really wanted to get around Kanas and the areas around it but didn’t have the time. Yea, the place is just too darn big. I lived there for 10 years and I STILL didn’t get to see everything I wanted to!